Most people working in technology and have heard of and formulated some opinion about the Microsoft Surface tablet, now in it’s second generation of hardware. For some it’s a poor attempt to compete with the iPad, for others it’s the greatest laptop replacement they’ve ever seen, destined to bring the brilliance of Windows 8.1 to the masses. Whilst I think it’s good for Apple and Android to have some competition in the tablet market, the Windows platform itself is of no interest to a GNU/Linux using, free-software loving individual like myself. What I do find interesting about the Microsoft Surface, is not the software, but rather the excellent high-specification hardware they’ve managed to cram into 980g of handheld excellence. I’ve been using my Lenovo X201i Thinkpad for about 4 years now and it’s due for an upgrade – whilst still very functional, the lack of AES-NI and a low resolution display and poor GPU is starting to get quite frustrating, not to mention the weight! The fully speced Microsoft Surface 2 Pro features a Core i5 CPU, 8GB of RAM and 512GB SSD, plus the ability to drive up to two external displays – qualities that would make it suitable as my primary workstation, whether on the go, or docked into larger displays at home – essentially a full laptop replacement. Since the Microsoft Surface Pro 2 is x86-based and supports disabling secure-boot, it is possible to run GNU/Linux natively on the device, suddenly making it very attractive for my requirements. It’s not a perfect device of course – the unit is heavy by tablet standards, and the lack of a 3G or LTE modem is a frustrating limitation. Battery life of the x86 Pro series is not where near as good as a low power ARM chip (although the Haswell Core i5 certainly has improved things over the generation 1 device)..
There’s also the question of cost, the fully speced unit is around $2,600 NZD which puts it in the same bracket as high end expensive laptops. Personally I feel these ads need more design effort other than the product name and the convincing slogan of “Get it”! 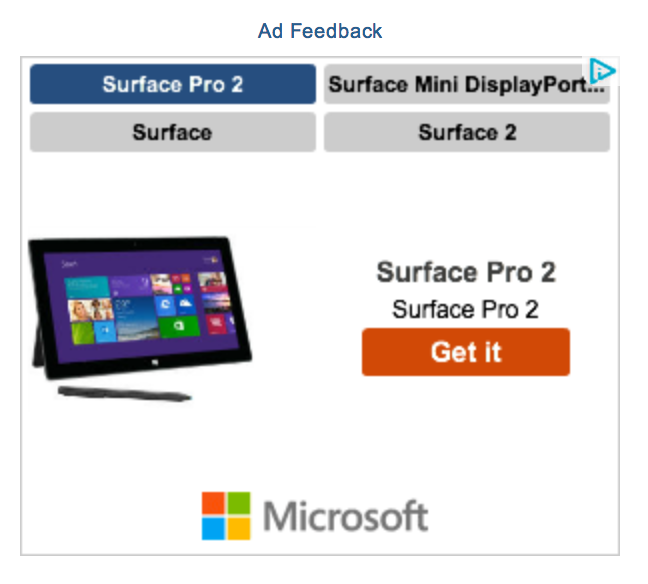 Microsoft has certainly spared no expense advertising the Surface. With billboards, placement marketing in TV series and internet advertising, it’s hard not to notice them. Which is why it’s even more surprising that Microsoft made the monumental mistake of not stocking enough units to buy. All models of Surface Pro 2, out of stock on AU online store. In fact, even it’s less loved brother, the ARM-based Windows RT version which can’t run anything other than Microsoft Store applications is out of stock as well. Even the feature limited RT-family of devices is sold out. The tablets seem to have been out of stock since around December 2013, which suggests that the Christmas sales exhausted all the stock and Microsoft has been unable to resupply it’s distributors. Possibly Microsoft limited the volume of units manufactured in fear of ending up with unsold units (like the difficult to shift Surface RT Gen-1 series that got written down) and didn’t manufacture as many units as they otherwise would have – a gamble that has shown itself to be a mistake. I wonder how many missed sales have resulted, where people gave up waiting and either went for a third party Windows tablet, or just purchased an iPad? Microsoft hasn’t even provided an ETA for more stock or provided an email option to be advised and get first dibs on new stock when it arrives eventually. Of interest, when comparing NZ and AU stock availability and pricing, the price disparity isn’t too bad. The top model Surface Pro 2 costs AUD $1854 excluding GST, whereas the New Zealand model sells for NZD $2260 excluding GST, which is currently around AUD $2137. This is a smallish difference of around $283, but this is probably due to Microsoft pricing the tablet when the exchange rate was around $0.80 AUD to $1 NZD. What I would expect, is that when they (eventually!) import additional stock to replenish supplies, the pricing should be re-adjusted to suit the current exchange rate – which is more around $0.95 AUD to $1 NZD. Kiwi pricing is a bit more eh bru? 15% GST vs 10% GST in Australia is the biggest reason for the disparity. Whether they do this or not, remains to be seen – but considering how expensive it is, if they can drop the price without impacting the profit margin it could only help make it more attractive. For now, I’m just keeping an eye on the stock – in many ways not being able to buy one certainly helps the house fund, but the fact is that I need to upgrade my Lenovo laptop at some point in the next year at the latest. If Microsoft can sort out their stock issues, the Surface could well be that replacement. This entry was posted in Uncategorized and tagged geek, laptop, lenovo, linux, microsoft, opinions, surface. Bookmark the permalink. Get a nice ultrabook instead? Most of them have touch screens these days, some let you rotate and/or detach the screen, iirc. (Been a while since I bothered browsing). Yeah not overly thrilled about giving money to Microsoft, although not sure that any of the other vendors have any higher moral ground…. Apple arguably even worse than Microsoft these days. You guys need to get over paying money for products. MS are no better or worse than any other company (in fact in my dealings with them, they seem very grown up and decent) Only 11 year olds who think “free” is “the answer” spout nonsense like that. Well them and the socially dysfunctional misfits who post on Slashdot of course. Listen, I was cutting 70+ floppy disks of Slackware before you guys were born ;) and Linux is lovely for what it is, I still use it and OpenBSD myself. But don’t let your love of one OS make you hate a company. Do you drive down the street and in your Ford and shout “you morons, Chrysler is evil!” because someone bought a different car to you? I don’t know why people feel such adversial stance based on their brand of choice for their computer. Seem silly? Thats cos it is. I have had all the Suface tabs, in fact, every mainstream tablet in my possession. I think you’re confused between free as in zero-cost and free as in freedom software. My use of the term above is the latter definition. Let’s refer to it as “libre” software in the rest of this comment to make the distinction clearer. I’m more than happy to pay for libre software. I like to be able to fund the work of developers, and it’s become increasingly easier with the adoption of app stores for mobiles OSes such as Android, which make it quick and easy to do small payments. However when it comes down to choosing between a libre application or a proprietary application, I’ll pick the libre one, even if the libre version has a purchase cost and the proprietary one is zero-cost (eg freeware/adware). The reason for me is that for me personally, the freedom to be able to customise that application and avoid being locked into a particular vendor, is worth far more to me than the financial cost associated with purchasing the software. Of course remember this is my personal view for my own requirements and beliefs. If I’m recommending systems for a customer or an employer, I have to evaluate other factors such as the total cost of ownership for the system, the talent/skills that the customer has to operate it and the risk and impact in the event of vendor lock-in to the customer. I’ve installed plenty of great libre software solutions. I’ve also installed my share of proprietary systems where it made sense for my customers because of their requirements. Finally I recommend you visit some internet communities other than Slashdot. I fear that if you surround yourself with extremist 11 year olds, you only end up with extreme views, rather than the complex variations in ideologies and beliefs of a more mature community.